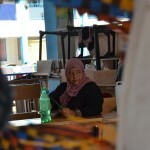 All photos by Shadi Alqarra. Hear and read the accompanying report by Rami Almeghari. 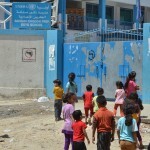 The entrance to UNRWA’s Albahrain boys’ school in western Gaza City. Yehya Hejazi and Reham Elkhaisy have had to postpone their wedding plans due to displacement. 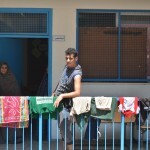 The Albahrain boys’ school now currently shelters 3300 residents displaced from the eastern areas of Gaza City. Displaced children play in the school’s patio to pass the time. 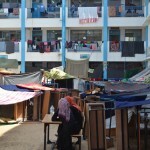 Even if a more permanent ceasefire is agreed to, some school will continue to operate as emergency shelters after the start of the school year. More than 16 thousand homes were destroyed during Operation Protective Edge and an 8-year-old blockade inhibits the import of construction materials needed to rebuild Gaza.